My family loves crockpots. At big family gatherings, there will be at least 2-3 crockpots working hard, and I have become a huge fan of them as well. Crockpots are not the sexiest or most glamorous kitchen appliance. They seem a bit old-fashioned and are often put away in a closet and forgotten. Please dig them back out and use them. They truly are the unsung heroes of the kitchen. I recognize not everyone loves leftovers, even I get tired of eating the same thing after more than three days. But I simply don’t have the time to make a homemade meal from scratch every night, and you probably don’t either. This is why you need a few recipes in your rotation where you can easily morph leftovers into new meals. Crockpot meals are perfect for this. They make plenty, so most of the work is already done for your next couple of meals. Plus, your family won’t even realize they are eating leftovers, making you look like a true culinary wizard. 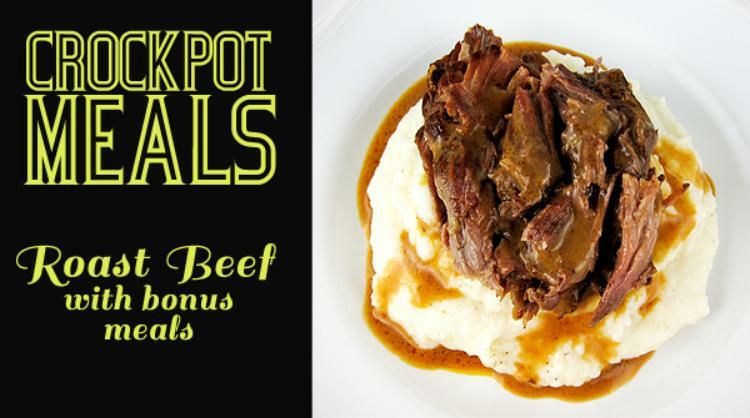 Crockpot meals are known for their ease, but sometimes they can be a bit bland. After cooking for 8-10 hours, it may taste as though you cooked out all the flavor as well. This is an easy fix—add fresh herbs before serving. I still follow the recipe and add all the herbs as normal, but I typically add a sprinkling of fresh herbs when serving. It immediately brightens the dish. Today, I’m sharing a flavorful and tender roast beef recipe along with two bonus remix recipes that come together quickly and will appease any leftover haters in your family. This is one of my favorite recipes. The roast is fork tender and begs for a big scoop of mashed potatoes. I am always happy to oblige. Cut slits into your roast and stuff with garlic slices. Salt and pepper the roast. Over medium high high, brown roast in a tablespoon or two of olive oil in a large skillet. Spray 6 quart crock pot with non-stick spray. Add onion slices to bottom of crockpot. Place roast on top. Deglaze skillet with Coke, be sure to get all the brown crispy pieces left in the pan from browning the roast. Stir in golden mushroom soup and onion soup mix. Pour over the roast. Cover and cook on high for 6 to 6.5 hours or until fall apart tender. Remove roast to a platter and slice or shred the meat. Stir sour cream into gravy, then pour into gravy dish. Special Notes You could also cook this on low for 8-10 hours or until tender. When storing leftovers, I separate the beef from the gravy to make it easier to make my leftover/new meals. PLEASE NOTE: If your family normally eats a 3 lb roast beef in one sitting or with very little leftovers, then you need to cook a bigger roast beef to ensure plenty of leftovers for the next two meals. Adjust gravy portions accordingly. 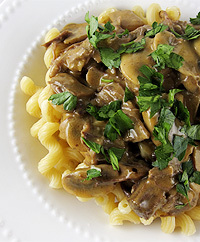 The first time I made Coke Roast Beef, I immediately knew the leftovers were destined to make a fabulous beef stroganoff. And they did. This comes together quickly, which makes it a perfect weeknight meal. Cook 1 lb of noodles according to the directions on the box. Meanwhile in a large skillet, add 2 tablespoons of butter over medium high heat. Add 1 diced shallot and 8 ounces of sliced mushrooms. Cook until tender, then add 1-2 minced garlic cloves and 1/2 teaspoon of dried thyme and cook for another minute. Stir in approximately 2 cups of the remaining roast beef and all the remaining gravy. Add 1 tablespoon of Worcestershire sauce and salt and pepper to taste. Bring to a boil, then simmer until noodles are cooked al dente. Stir in a 1/2 cup of sour cream before serving (optional). Spoon over noodles and top with minced fresh parsley. Special Notes If you find you don’t have a ton of leftover meat but still want to stretch it into two additional meals, you can cut back on the roast beef and add extra mushrooms. I would use one package of white button mushrooms and one package of baby portabellas. If you need to stretch your gravy, add a can of beef consommé. You may also need to thicken it slightly with cornstarch. Preheat over to 350 degrees. In a skillet over medium heat, melt 1 tablespoon of butter and cook 1 chopped small red pepper and 1 chopped small yellow onion until tender. Add your remaining roast beef (1 to 1/2 cups) and stir together. Unroll can of crescent rolls onto a cookie sheet lined with parchment paper. Spread meat and veggie mixture down the center of the dough, leaving about a quarter of an inch empty at each end. Top with 1 cup of shredded mozzarella cheese. Cut 1 inch strips on the long sides of the rectangle, just to edge of filling. Fold strips of dough at an angle with ends slightly overlapping the filling, alternating from side to side. Fold ends of braid under to seal. Spray braid with non-stick spray or brush with a beaten egg. Bake 16 to 22 minutes or until golden brown, rotating cookie sheet halfway through baking. Let stand 5 minutes before serving. Cut into slices.